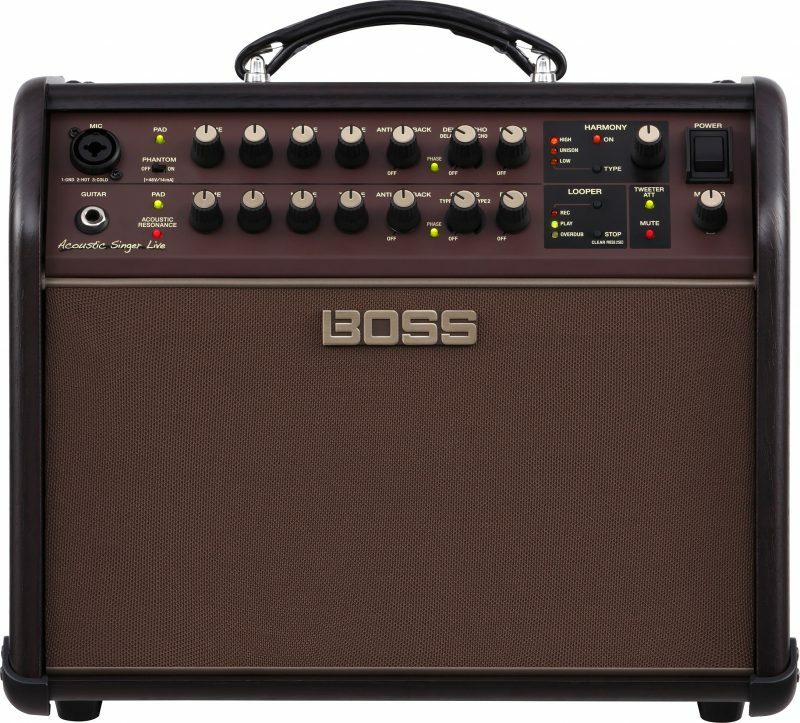 BOSS recently introduced their new Acoustic Singer Amplifier series, a new line of amplifiers geared towards acoustic singer/songwriters and duos. 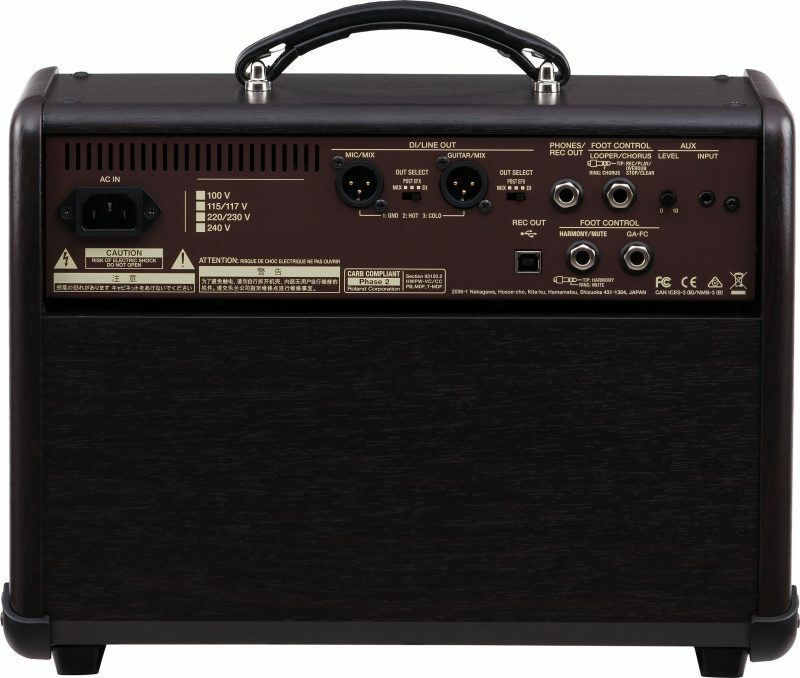 This amplifier serves as both an acoustic guitar amp and a vocal PA rolled into one featuring an effects processor that has a looper and a harmonizer. There are two models in the series- the Acoustic Singer Live and the Acoustic Singer Pro. I tested out the Acoustic Singer Live with my Fender acoustic, a Shure microphone, and a Roland GA-FC and BOSS FS-6 foot controllers (sold separately). The Acoustic Singer Live is the smaller of the two amps, being a 60 watt instead of a 120 watt; but other than the low/high frequency driver sizes, they both have all the same features. It has two channels and is very compact and not too heavy. I recently decided to play some solo acoustic shows and many of the venues I played require you to bring your own PA system. I have a small PA, but with the stands, etc., that can take up a lot of space which you don’t always have for the smaller gigs. Sometimes you have to just go directly through a small amp with vocals and the sound quality of that is never that great. I was eager to test this out as it would save a lot of energy and space having your vocal effects, amp and PA rolled into one. I also recently downsized my car, so I don’t have as much space for equipment as I used to, not to mention the load-ins and outs from the shows. Sometimes there are a lot of up and down the stairs while wearing something that’s aimed at making you feel and look nice, not necessarily for you to be your own roadie. Although I reviewed the smaller version which might not pack as much of a punch as the 120-watt pro, I thought this amplifier might be ideal for small restaurant or coffee shop shows and practicing at home. On the back of the unit, it has phantom power and a direct out of both channels which can be dry or wet, a 3.5 mm auxiliary in for use with an external audio player, and 1/4″ jacks for foot controllers. There’s also a USB 2.0 jack. The controls on the front panel are arranged in two rows. The first channel is the mic channel featuring the switchable phantom power of 48V for use of condenser microphones and an XLR 1/4″ input with independent controls for volume and a three-band equalizer for the bass, middle and treble. It also has an anti-feedback control and its own delay/echo and reverb effects, and a really good vocal harmonizer. The second channel is the guitar channel featuring a 1/4” instrument input and an acoustic resonance effect, independent controls for volume and a three-band equalizer for the bass, middle and treble. It also has an anti-feedback control and its own chorus and reverb effects. There is a tweeter attenuation button to take out some of the high frequencies and a mute button. It also has a looper which can be controlled from the amp or through a footswitch which is easier for live performances. I found the Acoustic Singer pretty easy to work with, and I liked the anti-feedback controls for when I wanted to crank up the volume a bit. There was a wide range of tones you can create from the amp. Using the EQ, you can create rich, warm tones or brighter ones for solos, etc. using the acoustic resonance. I liked the chorus effects and the reverb had a nice range to it for creating hall like sounds if needed. I would have liked the looper to be a little longer if needed as 40 seconds is the maximum amount you are able to use and there is no volume control for the loop. I used it with a BOSS FS-6 footswitch (not included). Like my other BOSS looper pedal, you have to double tap to stop the loop which I find difficult and annoying, as it’s easy to mess up the loops because of this which are challenging enough for me to do in the first place. Also, you have to press and hold to clear the loop and that gives you a moment of your previous loop before the pedal realizes you are trying to clear it which could be annoying at a live performance. A workaround with the clear function is to hit “mute” on the amp before holding down to erase. During a performance, keep in mind that if you hit the mute, it will also cut the vocals as well. You can change channels by using the foot controller, turning the boost, mid boost, loop and reverb, and if you buy the extra expression pedals, you can also change the drive value and volume. The channels are programmable, so you can tweak which settings you want for different songs and switch between them fairly easily. I would definitely recommend buying this pedal if you want to use the acoustic amp live. One thing that really impressed me was the vocal harmonizer. I have a BOSS VE-20 that I have been using live for a while, but I have never tested out a VE-8 Acoustic Singer pedal, which apparently is what is used for this amp. It adapts the harmonies of your vocals to whatever guitar chords you are playing, then picks out the appropriate live high or low harmonies for you. It sounds surprisingly real and a lot less “digital” than my other vocal effect unit which was one of the downsides of using that pedal. I am now considering an upgrade, though I mainly use mine for loud rock and roll shows, so I’m not exactly sure how it would handle it at those levels. It also has a cool double vocal layer effect if you want to get that double-tracked effect. All in all, I think this amp paired with the FS-6 footswitch, is an affordable and useful tool for performing singer-songwriters and I would consider adding one to my collection for the smaller solo shows I sometimes play, as it certainly saves time and effort and won’t break your back or your bank. Both the acoustic singer Live and Pro are a true bi-amped design.